Are you passionate about communication and advertising? Are you fond of creative people? Your Bucharest trip is about to transform into what you have always dreamed of: an endless free party in a dozen of places in Bucharest, where you will meet interesting people, do fun activities, discover new things and feel like a local! This Night, Agencies in Bucharest (and not only) are opening their doors starting 8 pm until midnight and even later! They have prepared for you concept parties and events, surprisingly fun and twisted. Do not miss this night, Bucharest is opening for you with its best! 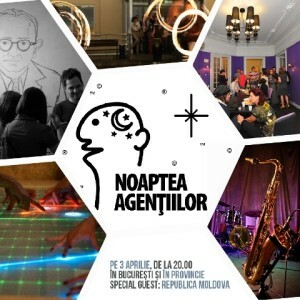 Agencies Night (Noaptea Agentiilor) is an event organized by The Institute. PQB – Digital. Unplugged. Party! Come to the Digital. Unplugged. Party with PQB communication designers. Drawings and texts come alive! There is no cure for creativity, but Kubris is going to diagnose it after a first passion checkup. There are people suffering from various creatiseas such as writhitis, blogorrhea, baking bad or technolosis, what about you? WebDigital is the host of the youngest and most rebel entrepreneurs! Are you a passionate about online marketing? Do you have a cool online business you want to promote? The team @ WebDigital is waiting for you with nonconformist ideas! Their team is ready to “vandalize” the agency quarters, so come with your smart phone or tablet to catch the moment! During Bucharest Creative Agencies Night, the event hosted by Creionetica agency, “The Art of Consuming”, is a light and creative introspection, with screening, posters exhibit and talks about the concept of the social awareness campaigns (Consumix). The event @ Creionetica will also invite as special guests the friends of the agency: visual artists and craftsmen, bringing along their stories, works and products. CEASTONBURY is a “handcrafted festival” designed by Lowe agency for Bucharest Creative Agencies Night, where music, fun, crafted objects, homemade hot dogs and beer will make this Bucharest night unforgettable for you! Are you in the mood for an unforgettable selfie in Bucharest? This could be the selfie you will capture in a Romanian funny and smart agency! Be the main character of a social media campaign on the spot, right in the middle of digital & story crafts workshops during Bucharest Creative Agencies Night ! Webuzz teases you with the most valuable gift. Are you curious? Come to the buzz side, we’ll have stories! These guys @ tNd'c advertising definitely know how to make a twisted text! Not sure what they are planning for you this night, but you’ll see their Dorobanti villa in the most posh Bucharest area. They are not the posh type, so don’t be afraid and dot the spot with red on your Creative Agencies Night map and it will eventually make (some) sense. MEC & Mindshare invites you to a creative Funfair during the Agencies Night! Masks, balloons, puppeteers and rag fair, you get all the fun and colour your Bucharest night with a twisted circus concept! Best gaming party during Bucharest Creative Agencies Night! Traditional or digital games, contest, offline games, good music on the terrace! Cooking sessions, dance lessons or cinema screening marathon +sweet surprises and a drop of adrenaline! After six Café is the place to tell stories. First collection of Bucharest advertisers' passions is waiting for you. Try a different approach to experience the city by being part of the Bucharest Creative Agencies Night! You can craft your way up in Escape from eventures. The rules of the game are easy: discover the characters, find out their crafts and you enter the eventures world! Find out the crafts in each world, gather pieces of information and the last level of the game will find you discovering your own crafts! "Bucharest Creative Agencies Night 2014" Festival in Bucharest. You can get here description, reviews, address, time and details of "Bucharest Creative Agencies Night 2014" Festival in Bucharest. Visit Bucharest Tips for more Festival events in Bucharest!